Specifically the processes certain food and beverage products go through cause damage to the process equipment. Dust, flour, sugar, water, debris, waste and acidic ingredients all degrade with particular negative effects on conveyor systems and bearings. Bearing seals become damaged by water jets during wash downs, dust, flour, sugar and other debris have an abrasive effect on seals and will also create premature wear on bearings themselves. Once bearings are contaminated, friction will shortly cause a breakdown. Oxifree Metal Protection coatings provide a barrier to these contaminants thus ensuring your processes remain running efficiently. 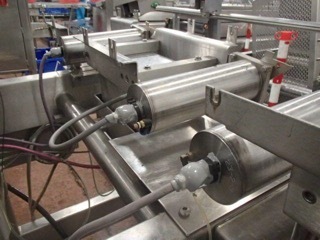 Production lines are depended on all equipment in the process working to its optimum, if one area is damaged and rendered ineffective the whole process is impeded. Roller and drive bearings are often the weak link, but now there is a cost effective and ecologically safe solution… Oxifree!